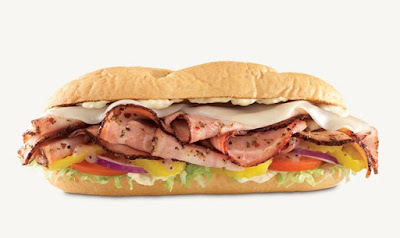 Arby's adds porchetta to the menu for the first time with the arrival of the new, limited-time Smoked Italian Porchetta sandwich. Porchetta is basically a boneless pork roast rolled up with herbs. Arby's version is described as "pork loin is herbed, rolled, and smoked for eight hours." As with most of Arby's meats, it's served thinly sliced. In addition to porchetta, the new sandwich features much the same ingredients as on their regular-menu Loaded Italian sandwich: banana peppers, Italian seasoning, red onion, tomato, lettuce, smoked provolone, a red wine vinaigrette, and garlic aioli, on a toasted Italian roll. 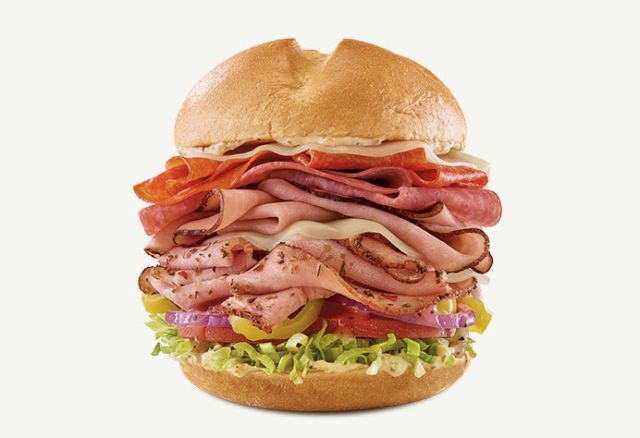 For those looking for something heftier, the chain is also offering the Mount Italy sandwich. It features porchetta, Genoa salami, pepperoni, pit-smoked ham, smoked provolone cheese, banana peppers, lettuce, red onions, red wine vinaigrette, tomato, and garlic aioli on a star-cut bun. Both sandwiches are available at Arby's through the end of August. The suggested price for the Smoked Italian Porchetta sandwich is $5.49 and the suggested price for the Mount Italy is $6.99.